MAGNIFICENT Craftsman Style Home in Sandy Ford Fairhope! 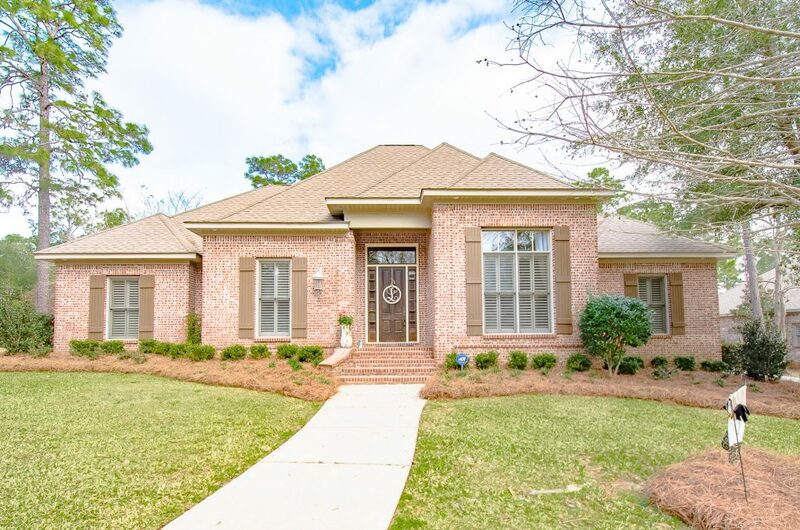 Come feast your eyes on this MAGNIFICENT Craftsman Style Home in Sandy Ford Fairhope! When this seller was asked, “How did you know you were meant to buy this home?” she replied, “I have a little wooden sign in my house that says, ‘Difficult roads often lead to beautiful destinations.’ I was going through a very difficult time in my life when my twin three year old boys and I found this beautiful home nestled in Sandy Ford, a lovely neighborhood filled with beautiful trees, greenery, and last but certainly not least, gorgeous homes. The boys and I were searching for an oasis so to speak, to get away from the world – at least for little times here and there, but a location that would be convenient to all the places we enjoyed going. What we did not know was that this home would open up new activities for us, and we would spend countless hours playing and relaxing in our backyard, surrounded by the privacy of the protected trees directly behind our house. We have enjoyed watching the graceful deer that roam the neighborhood as well as the many birds, rabbits, and squirrels. When the boys were younger, we would take picnics to other natural common areas and make up stories about the “woods,” while enjoying nature yet again.” Schools were absolutely a factor in the seller’s decision to purchase this home. Fairhope schools are some of the best in Baldwin County, and she particularly wanted to be in the Fairhope zone for Elementary School for the many benefits that the little ones have, being centrally located with the Downtown Fairhope area. The boys were afforded opportunities to walk to the bay for egg hunts, parties in the sand and on the playground equipment, as well as field trips learning about the fish, etc. Not to mention walking to shows at the Fairhope Civic Center, and trick or treating among the area merchants. They have had good experiences in the Fairhope schools, the same schools that the seller attended years ago. It is her understanding that they are rated quite high in Baldwin County. I asked her what were her top 5-10 favorite features of the home and well…there was a lot to say. “First, and I know I kind of hit on this earlier, I love the natural beauty of the neighborhood. It is relaxing, and colorful nearly all year long. I like having the garage open to the back of the home, for several reasons. First, when my boys were younger, it gave us a great place for them to ride their tricycles around on the concrete, while being safe from the road. Which leads me to another thing I like about this home, it sits on one of the best streets in the neighborhood, Cuscowilla Lane. Cuscowilla is nestled nicely in Sandy Ford, and is not a through street, which really cuts down on traffic. By the way, our neighbors are the best-having even become friends! I enjoy my back porch, and the fact that I can access it from my bedroom and from the kitchen. Again, I love the privacy of the back yard, with the common area which will not be built on directly behind the property. I have enjoyed the large breakfast room, and additionally, working from home on three days a week, I love the office. 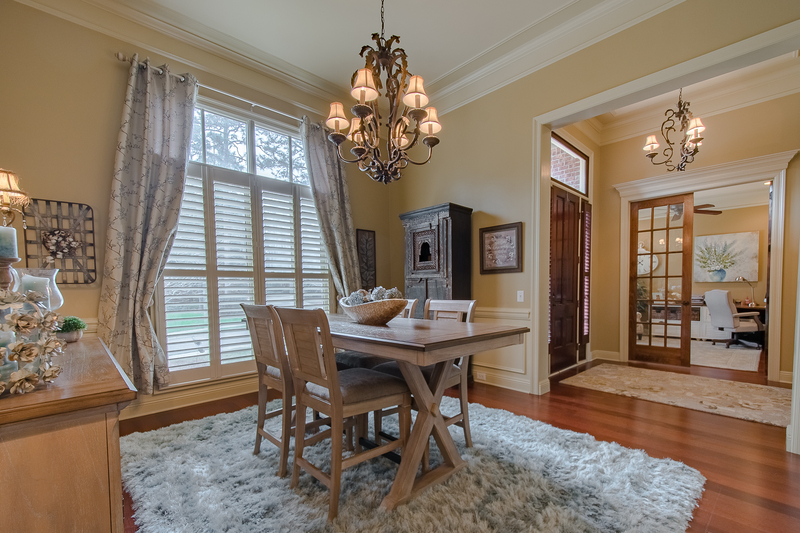 It is a really awesome room, especially with the beautiful French doors. This room has great potential even if you do not require a home office. While there are other things I really like about this home, I will end with two. The built-ins in the den, as well as the very high ceilings which give the home an even larger, grand feeling. “Sandy Ford is a beautiful relaxing neighborhood, which can be an oasis from the “real world,” but is just a hop, skip, and a jump from Daphne, Mobile, and the Bay! It is a fabulous location, and one that I will miss in many ways. I LOVE to shop at Publix for groceries and it is a convenient 5 minutes or less drive. I also will go to Target on occasion which is not much farther. The downtown Fairhope shops such as The Cat’s Meow, DeJaVu, M&F, Objects, and the Fairhope Pharmacy are all great as well. Speaking of pharmacies, Publix is great, and quick, and again, convenient. Well, the most obvious hobby associated with our neighborhood would of course be golf. One of my sons has played a little here and there. I think I mentioned earlier that when my children were younger, we would take walks and bike rides around the neighborhood, where we would picnic and make up stories. There is also a little wooden park in Rock Creek that is an easy bike ride to get to, which is fun to visit. Selling your home can be full of mixed emotions. The seller is going to miss the great friends that she has made in the neighborhood, especially those living right around me. She feels very fortunate to make some lifelong friendships that she will always cherish. Misty will miss the beautiful natural scenery, the deer, the bunnies, and the birds and she will miss the memories of my toddlers running around the house and the yard, making many wonderful memories. She says, “This home has been loved, and in many ways, it has loved us back.” Finally, and not least, she will miss the awesome location. Location, Location, Location!! It’s a difficult choice to sell for a couple of reasons. One is that despite the great location, she is now driving to the Summerdale/Foley area quite a bit more often as her parents live there and are needing her more than they used to. Now that the boys are older, she is planning to downsize slightly as well, as her boys do not have many more years with her before leaving to pursue their own goals in college. However, the seller says, “We will miss this home, and will fondly look back on our many happy years here, from walks and bike rides, to slip n sliding with the neighbors, to camping in the back yard – and in the den, as well as the many Halloween cookouts over the years.” Yes, it is true, “Difficult roads often lead to beautiful destinations.” And this house, this street, this neighborhood is one of those beautiful destinations! Tour this MAGNIFICENT Craftsman Style Home in Sandy Ford Fairhope with the Jason Will Real Estate Team 251-866-6464.